So I have a 10 foot 1200+ gallon QT tank being used to house 3 small Juvenile/pup black tip reef sharks (24 inches). Anyways, 6 weeks of QT had past. The Friday morning while the pups were being feed. The #3 only ate 1 of the silverside and refused anymore food. The following week we received another replacement. from the supplier. This 1200 gal QT gets 400 gallons of water changes per week. it has a jumbo skimmer that pulls out 3/4 - 1 full gallon of skimmate per day. 80 lbs of ceramic media and 100 lbs of live rock. <The wear and tear before you received them is at work here. I REALLY wish folks would not sell "sharky" sharks. Stick with the boring epaulettes, bamboos... that spend a good deal of the time on the bottom. I have been Googling to find information on acclimatising black tip reef shark. We are receiving the BTRS in couple of days and would really appreciate any and all information on BTRS acclimatising, caring etc. <"Any and all"??? That's a big ask. Well, presumably you've kept giant/public marine aquaria before? And sharks generally? Nobody in their right mind would choose these sharks as their first jumbo marine fish, and indeed, you'd have to be doubly crazy to choose them as the first shark species kept! Big, extremely demanding in terms of space, utterly and completely unsuitable for the home aquarium (unless perhaps you're a Bond villain with an undersea mansion). Will sicken, get damaged and/or die at the slightest shortcoming in maintenance. 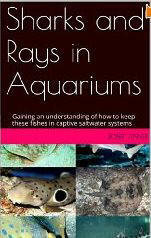 Would strongly recommend buying, reading Bob F's electronic book on keeping sharks. Since only someone for whom "money is no object" would even think about buying a marine shark, the $10 price should seem a trivially minuscule investment! Yes i have gone through that piece of article which is quite informative. Apologies for not giving you adequate information. We are a company dealing in ,marine designers aquariums and been in the industry for over 8years and many more years as hobbyists. We are setting up this BRTS tank for a client which is installed in a shopping mall. The information we are looking for is how to handle BRTS after we receive it at the cargo, what precautions we need to take while transportation, temperature, water chemistry etc...transferring to aquarium etc. But will also leave this message in Bob F's mailbox in case he has anything to add. Would recommend you read, digest all the linked articles and FAQs. in ,marine designers aquariums and been in the industry for over 8 years and many more years as hobbyists. In fact have already gone through this link already, nonetheless will go through it again. what we don't want hence being really responsible for the lives of these animals and looking for all/any information which we can get our hands on. We don't want to make any mistake or overlook smallest of detail. I’m Mike Giltzow with the Aquarium in Boise. We are planning to build a new shark tank and I wanted to ask a few questions while we are still in the planning stages. We want to get it right in the beginning. The preliminary plans show a trapezoidal shape apx size is 16’ at the short width end, 24’ at the long width end and apx. 32’ long and will be apx 8’ high. Sorry for all the apx. measurements but we are still very much in the early stages of planning this tank. After reading Mr. Fenner’s book I see that we need to rethink a few items starting with the square corners of this trapezoid. So we would be rounding those corners and what I would like to know is what radius on those corners we should be using? Or should we just forget the trapezoid (which by the way fits our building layout – that’s why the shape was chosen) and do an oval? Maybe an oval that tapers a little at one end? My second question concerns rebar in the tank. I note that in “Sharks and Rays in Aquariums” that Mr. Fenner states “Even metal rebar (reinforcing steel) cast into concrete walls in public aquariums has been indicted as ‘driving these fishes crazy’ , resulting in their deaths.” So if we don’t use metal rebar in the walls what would be an alternative? Could we use a plastic reinforcing or could we coat the rebar? What would you recommend? Hi Mr. Fenner and thanks for taking the time to answer my questions. The Black Tip does not look physically damaged. In fact when he is swimming normally it is easy to mistake him for the other black tip in the tank. The 'second opinion' vet has indicated that he would like to do blood work; so we will know more when he does that and I will pass the information on to you. I don't know if we use Mazuri food supplements but will find out and let you know. Have you ever seen a black tip or other species of shark exhibit this type of behavior? Appreciate the information on the tank. I was wondering if a (L x W x H) 160" x 60" x 50", 2000 gallon, racetrack tank would be enough for a black tip reef shark ( not full grown obviously) and till what age and size could it be kept in that tank. Thanks. I have several questions about black tip reef sharks and was wondering if you could have me answer them. 1. What size are black tip reef sharks born at and how many inches do they grow per year? 2. What is the best type of filtration for a black tip reef shark? 4. Can corals be kept with it? 5. Is there a "shark food" that you are aware of that can be bought at stores or online instead of fish and squid from the supermarket? 6. What is the best shape tank for a black tip reef shark, is racetrack shape good? 7.what is the minimum tank size for a black tip reef shark, not until it fully grown, just until its 3.5 feet, what would be the minimum length width and height for a 3.5 feet black tip reef shark? Thanks a lot Bob, your the best. <You're? I'll do... can after all only by my self... and am happy as such. I was wondering if you could recommended a filtration set-up for a black tip reef shark tank. I looked on your website and could not find anything on black tip reef shark filtration. Thanks. Thanks for the link again, but I couldn't find a paragraph specific,y about black tip reef shark filtration. Thanks. Hi Bob and Crew, hope all is great this weekend, I need our advice. tank for this fish will be with a 30 " 3 year old Blacktip Shark; the question is: Do you think the Grouper will be safe with the Blacktip or I should grow the grouper a bit more separate and if so to how many inches? I thought that because of the Grouper's temperament, it will be safe but I guess this is not the case so regarding Grouper´s size what do you think it must measure to be "respected" by the shark? We have 20 Blacktip Reef Sharks ( *Carcharhinus melanopterus* ) in 400 m3 tank. We have had them for over 1 year now but lately, I have noticed their chin getting fat and unusual. It looks like they have a tumor(i send you some of their pictures). Beside that, They are doing fine and eating normal but I'm so worry. I don't know it's just they are too fat or it's a disease sign. I looked up everywhere but I cant find anything the same. I hope you can give me some advices. Here is condition of my tank: pH: 7.8, Ammonia: 0 mg/L, Nitrite: 0 mg/L, Nitrate: 0 mg/L, Salinity: 29 ppt, Temperature : 29 OC. its tankmates are 9 stingrays, 14 small turtles and 5 white tip reef sharks (white tip reef shark 's chin are normal ) We feed the sharks with fish and feed them once in 2 days. please help me! Any advice from you guys would be appreciated. <This condition is VERY dangerous. Needs to be addressed ASAP, their diet supplemented. Do you understand? I saw a query in the crew mail related to sharks "Help me with my sharks please" that I can handle for you, but it won't be as complete as might be needed. That is, I know the problem is goiter, related to an iodine deficiency, but the fact that there are probably other issues going on is something I may well miss. I've never kept sharks, much less Black Tips, 20 at a time, along with turtles and other sharks in a system and am not sure of their requirements re: tank size, chemistry, etc. If you're in a crunch for time, I can handle it for you though and go over the iodine issue. Just let me know..
We have 20 Blacktip Reef Sharks ( *Carcharhinus melanopterus* ) in 400 m3 tank. We have had them for over 1 year now but lately, I have noticed their chin getting fat and unusual. It looks like they have a tumor (I send you some of their pictures). …but I'm so worry. I don’t know it's just they are too fat or it's a disease sign. I looked up everywhere but I can’t find anything the same. I hope you can give me some advices. Here is condition of my tank: pH: 7.8, Ammonia: 0 mg/L, Nitrite: 0 mg/L, Nitrate: 0 mg/L, Salinity: 29 ppt, Temperature : 29 OC. Its tankmates are 9 stingrays, 14 small turtles and 5 whitetip reef sharks (whitetip reef shark's chin are normal) We feed the sharks with fish and feed them once in 2 days. Please help me! Any advice from you guys would be appreciated. Thank you so much for your advice and the links you gave me. I will do as you said and hoping the goiter will go down. Your e-mail was like a lifesaver to me. Once again, thank you so much for your big help. Hi Bob, I need your help please! This week temperature went down here in Mexico City and my costumers shark tank drop to 70 degrees. My guess is that the shark got hypothermia(let me know if I am right).we spend the whole night and part of this morning raising tank temperature, now it is 75 degrees but the shark barely swims and sinks on the bottom after just a few laps to the tank. I grab it every time carefully and force him to swim, I increase aeration and last night add some ph up(Brightwell Aquatics) but don´t know what else to do, is it possible that having his temperature back to normal his muscles and other body organs work again or he is far gone? Please help me the answer is not on your files, I was searching for hours. I didn´t know they could get that bad at 70 degrees, I mean it is not really cold but they are tropicals hu. The only problem to be solve is de Ph/Kh issue, I can´t raise it to the right levels, is there an effective product that you recommend? I have a 2500 gallon aquarium housing 2 Blacktip sharks. I am planning to add 2 blue spotted stingrays but couldn't find any information about their compatibility. Any ideas? One more thing, my system doesn't have w/d system but more than 800lbs of live rock. Should I add one?